No one wants to speak against the Bible, but the sentiment in Ecclesiastes famously insisting "to every thing there is a season, and a time to every purpose under heaven" in no way applies to the universe of film festivals. Month in, month out, from the Flickfest International Outdoor Short Film Festival starting in early January in the Bondi Beach area of Sydney, Australia, through the Autrans Festival of Mountain and Adventure Films ending in mid-December in the high, thin air of southeast France, there is barely a day on the calendar where some film festival is not being celebrated in some exotic city somewhere in the world. Haugesund, Norway, Oulu, Finland, and Umeå, Sweden, have festivals, as does Trencianske Teplice in the Slovak Republic, India's Thiruvananathapuram, Iran's Kish Island ("the Pearl of the Persian Gulf"), the Australian beach resort of Noosa, and the Italian city of Udine, which unexpectedly bills itself as "the world's largest showcase of popular East Asian cinema." There are nearly sixty Jewish film festivals in existence but only one QT event, in which director Quentin Tarantino annually takes over the Alamo Drafthouse Cinema in Austin, Texas, and shows favorite films to benefit the Austin Film Society. There is even an intentionally stateless movable feast called Transfest, which facilitates "the simple idea of introducing film festivals which take place somewhere in the world, in another place." Festivals have become such a growth industry that Missoula, Montana, has two and a petite but trendy town like Telluride, Colorado, now has three (MountainFilm Festival and IndieFest 2K in addition to the regular Telluride event). And, especially in Europe, various coordinating bodies have grown up to try and create order out of the impending chaos. 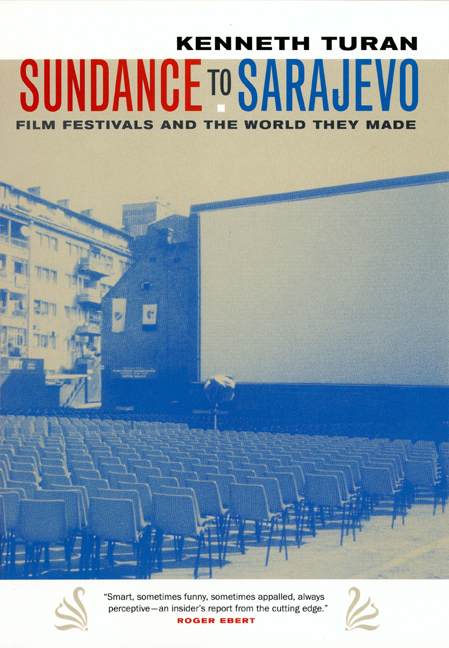 On the largest scale, the European Coordination of Film Festivals, created to remedy "the disparity of practises and some dangerous excesses and trends" of the continent's proliferating fests, listed 76 festivals when it began in 1995, a number that had more than doubled to 154 in twenty countries by 2000. On a different note, the existence of overlapping science-fiction-oriented events led to the birth of a European Fantasy Film Festivals Federation to, in its own words, "put an end to a grubby war and sign an armistice." This group joins festivals in Porto, Brussels, Luxembourg, Rome, Espoo, Stiges, Amsterdam, Lund, and San Sebastián to, among other things, annually present the Méliès d'Or (named after the great French imaginative director), a.k.a. The Grand Prize of European Fantasy Film. Even with all these official bodies, no one seems to be exactly sure how many festivals there are in the world, not even books created specifically to keep track of them. The Variety Guide to Film Festivals by Steven Gaydos lists more than four hundred, while three other books (International Film Festival Guide by Shael Stolberg, The Film Festival Guide by Adam Langer, and The Ultimate Film Festival Survival Guide by Chris Gore) record over five hundred each. Because, except for big names like Cannes and Sundance, there is less overlap in these listings than one might expect, it's possible that an outlandish-sounding New York Times estimate of more than a thousand fests around the world might not be as wild as it seems. That's enough for the festival circuit to have its own print publication ("Iff, the international film festival magazine") as well as a DVD periodical called Film-Fest, which happily describes itself as "your exclusive all-access pass to the latest movies, the coolest parties, the hottest filmmakers and the brightest stars that travel the globe to celebrate the art of film." Not surprisingly, film festivals are especially a growth area in the United States—so much so that critic David Thomson, in an arch list in Movieline magazine entitled "100 Questions We Honestly Want to Ask Hollywood" ("What is Tom Cruise going to do instead of aging?" "Why do they make the new James Bond films seem as if they were made in 1962? "), found space to wonder "Can anyone name five cities in America that do not now have film festivals?" This proliferation is visible across the board. While New York, ever the cultural behemoth, hosts an estimated thirty festivals (the wildest being the New York Underground Film Festival, annually home to questionable items like Home Brewer Serial Killer and Farley Mowat Ate My Brother), North Carolina boasts thirteen, including something called the Hi Mom Film Festival in Chapel Hill. It's one thing for just about every city within cheering distance of Los Angeles (Palm Beach, Malibu, Idyllwild, Temecula, San Luis Obispo, Santa Barbara, Santa Monica, Santa Clarita, the Silver Lake neighborhood proper, and the surfside trio of Newport Beach, Laguna Beach, and Hermosa Beach) to have a festival; it's another to witness a similar proliferation in the Midwest. Say hello to the Great Plains Film Festival in Lincoln, Nebraska, the Heartland Film Festival in Indianapolis, even the Hardacre Film Festival in wee Tipton, Iowa, set in the historic circa 1917 Deco-style Hardacre Theater and created, its promotional material would have you believe, to answer that age-old question, "Yes, but will it play in . . . Iowa?" One result of this phenomenal growth is that films no one has heard of can take home heaps of honors. The yet-to-be-distributed and all-but-unseen Wedding Cow (formerly known as Good Cows Are Hard to Find) boasted in a press release of winning a full ten awards, including the Daedalos from IndieKINO, the International Independent Online Film Festival of Seoul, South Korea, and the Golden Unicorn from the Europaïsches Filmfestival Alpinale in Bludenz, Austria. Garry Trudeau astutely gave a nod to this fest-mania in his "Doonesbury" comic strip by having B.D. 's actress wife Boopsie, the star of "Chugalug," "Beerblasters," and "Pompom Pam," be the subject of "The Barbara Ann Boopstein Film Festival," sponsored by the Aspen Ski Patrol and highlighted by, she is pleased to report, "a panel discussion of my film work! Led by Roger Ebert!" Even a Boopstein festival doesn't seem out of place when you consider some of the stranger names on the festival circuit, events so outlandish they sound apocryphal even if they're not. What is one to make of items with names like the Takoma Tortured Artists Film Festival in Washington state; Eat My Shorts! Comedy Short Film Showcase in Montreal, Canada; Eat My Schlock! Home Grown Trash Film Festival in Brisbane, Australia; and Short Attention Span Film and Video Festival in San Francisco—not to mention another San Francisco event, the Brainwash Movie Festival, whose top prize is said to be the "Charles Manson Loose Eyeball" award? The first movie event I was exposed to growing up in Brooklyn was the always serious New York Film Festival, which began in 1963 and included in its first five years classics like Roman Polanski's Knife in the Water, Milos Forman's Loves of a Blonde, Gillo Pontecorvo's The Battle of Algiers, Bernardo Bertolucci's Before the Revolution, and an explosion of films from Jean-Luc Godard: Band à Part, Une Femme Est une Femme, Alphaville, and Masculine-Feminine. Not that I had the means to actually see all these films; it's the feeling of festivity and potential I remember from my younger days, the excitement of the full-page ad announcing the event's selections, written up in stirring prose, that appeared every year, one time only, in exactly the same format in the Sunday Arts and Leisure section of the New York Times. I felt, as I have not always felt since, the sense of a door opening into a world of culture and sophistication I had no idea existed, as well as the hope that there might be a place in there for me. That feeling was only part of what I experienced in 1971 during my first trip to a major world cinema event, representing the Washington Post at the Cannes Film Festival in the exotic (to me, at least) south of France. Mostly I was exhausted, deluged by more movies more often than I wanted to handle. As naive as I was young, I confided these thoughts to the storied Italian director Luchino Visconti, one of the masters of cinema, who was doing interviews to promote his Death in Venice. "Isn't it a bit overwhelming?" I said to the great man, whose vibrant argyle socks I still remember. Visconti turned his hawklike, aristocratic face, features suitable for a fifteenth-century condotierre, to me in shock. "It is cinema, cinema, cinema, all the day long," he said, restating the obvious for my benefit. "I love it." From that time to this, I have struggled to have Visconti's enthusiastic attitude toward festivals, but it has not been uniformly easy. Though they are often held in pleasant, diverting cities, too many theaters, too many deadliness, too large crowds, too much relentless hype, and too few memorable films can make these events more of an exasperating ordeal than might be imagined for a working reporter or critic. Yet, paradoxically, it was the enormous number of cinematic celebrations overloading the world circuit that reinvigorated my interest in film festivals. I was intrigued by how many there were, how they styled themselves, and in what unexpected corners of the globe they appeared. I began acquiring brochures and pamphlets from events that caught my interest, and soon I had a collection serious enough, if not for a doctoral thesis, at least for some broad general observations. Given that there are so many of them, the key thing these multiple festivals share is a need to differentiate themselves from each other. Sometimes the boast is straightforward, if a bit narrow, like Neuchâtel's claim to be "the only Swiss film festival devoted to the bizarre and the imagination," Toronto's Rendezvous with Madness and its focus on the myth and reality of mental illness, or the Rencontres Internationales Henri Langlois in Poitiers, France, which concentrates on film school projects, annually choosing some sixty examples from approximately three thousand short- and medium-length works nominated by 140 schools. Sometimes a festival's unifying concept is completely unexpected. The Golden Knight Slavonic Film Festival in the Ukrainian city of Kiev focuses on Slav brotherhood and Orthodox Christian values. Copenhagen's Night Film Festival annually sells 40,000 tickets despite screening all its films between midnight and 6 a.m. while, at the opposite end of the spectrum, Italy's International Giffoni Children's Film Festival recruits kids to discuss films with their directors and stars. Occasionally the fit between subject and locale is so good that the synergy creates an international institution. Dinard, a town in France's Brittany, became so identified with its Festival of British Cinema that it placed a giant replica of the event's trophy, director Alfred Hitchcock with a bird on each shoulder, on the local boardwalk. And Cognac's devotion to thrillers and suspense films means that festival guests are politely fingerprinted in the town square and get served brandy and orange juice cocktails before screenings. In the United States, both Nantucket ("Where Screenwriters Inherit the Earth") and Austin ("King of the Screenplay Festivals") have made names for themselves focusing on the underappreciated writer, with the Texas festival handing out what it calls "the coveted (and lethally heavy) Austin Film Festival Typewriter Award." Perhaps the oddest corner of the festival universe is the one for films that other events have scoffed at. Roger Ebert uses the University of Illinois at Urbana-Champaign to host an Overlooked Film Festival, and one of the several festivals at home in Santa Monica is called "Dances with Films" (motto "No Politics. No Stars. No Sh*t"), which insists its entries must have no known actors, producers, or directors or, for that matter, no money from any known company. Most refreshingly forthright of these events is Philadelphia's baldly named Reject Film Festival, with a VCR reject button for its logo and a frank parenthetical slogan: "As if a gathering of bitter, angry artists could be called a 'festival."" Proud of the way it "enables filmmakers to triumph in the face of rejection," it requires a dismissive letter from another event with its application and has become so popular, Daily Variety reports, that "the Reject Festival is not above rejection itself." Besides coming up with surprising concepts, festivals can also set themselves apart by the nature of the prizes they give competitors. No two festivals hand out the same award, though after taking account of things like the Golden Raven (Brussels), the Golden Frog (Torun, Poland), the Golden Calf (Utrecht), the Golden Olive (Kalamata, Greece), the Golden Orange (Antalya, Turkey), the Golden Bayard (Namur, France), the Golden Boomerang (Noosa), the Golden Alexander (Thessaloniki), and the Golden Anchor (Haifa), it does seem there is no object, either natural or man-made, that has not been gilded for presentation. Perhaps tired of this particular gold rush, the Taos Talking Pictures Festival has gone in another direction with its top prize, the Taos Land Grant Award, which is nothing less than five acres of homestead property atop the Taos Mesa. The idea, the festival says, is "to plant media artists in the fertile soil of New Mexico" with the hope that a filmmaking community will take root and flower. As to why so many festivals are flowering here and now, the reasons are severalfold, starting with the desire of the municipalities that host them to get their names before a wide public and attract visitors both during and after the celebration in question. The key cause of festival proliferation, however, is a symbiotically linked trio of factors. Newly active independent and foreign-language filmmakers hunger for appreciative audiences, a need that dovetails nicely with audience members' yearning for alternatives to the standard Hollywood fare that dominates film screens not only in this country but worldwide. And small distributors as well as national film industries locked into an unequal battle with the American juggernaut see these hungers as a not-to-be-missed opportunity to both earn money and promote their goods to the fullest extent. For while movie fans have not lost their taste for the artistic and noncommercial, theaters are not always willing to risk showing those films. "Of course there are too many festivals," Pierre-Henri Deleau, former head of Cannes's Directors Fortnight told Daily Variety. "People are going to them because theaters aren't doing their jobs to show films from the rest of the world." Festivals have become, in effect, what Piers Handling, head of the powerful Toronto Film Festival, has called "an alternative distribution network. A lot of work only gets shown now at festivals. A lot of foreign-language film that would get distribution ten years ago doesn't get seen anymore." France has been especially assiduous in using festivals around the world to get its cinema seen, and it's impossible to imagine the current critical rage for Iranian films without the intense exposure these works have gotten at Cannes, New York, and elsewhere. Even for those films that do get seen outside festivals, the event and its high-profile gathering of critics and journalists as well as the kind of intense partisans who create word of mouth mean festivals are also useful to distributors as an inexpensive marketing tool for about-to-be released movies that can't afford to lavish tens of millions of dollars on print and television advertising. "We'll play every regional festival we can," Tom Bernard of Sony Pictures Classics told the New York Times. "It's all about building buzz and creating awareness. Film festivals are an alternate p.r. universe. They save us millions." And earn millions as well. A key to the unprecedented success of Sony's Crouching Tiger, Hidden Dragon (four Oscars and more than $100 million at the box office, a U.S. record for a subtitled picture) was its shrewd use of film festival exposure, starting with a rapturous world premier at Cannes, a brief stop at Telluride, the opinion-makers' favorite, and then a bravura capturing of the coveted audience award at Toronto. Given this ever-expanding universe of choice, how were the dozen or so festivals profiled in this collection selected? Some, like Cannes and Sundance, were obvious choices: besides the fact that I've been going to them for a decade and more, you can't hope to understand why and how festivals function without considering the ins and outs of the biggest, brashest, and most influential of the bunch. The other festivals investigated were not random selections. The ones I've focused on not only show films, they serve as picture windows onto a wider, more diverse world and cinema's place in it. Sometimes, as with Sarajevo and Havana, film is a vehicle for trying to understand the international political community's most vexing dilemmas. Sometimes, as with Burkina Faso's FESPACO and Pordenone's Giornate del Cinema Muto, it's a chance to examine the very nature of the cinematic experience. For different reasons and at different times, each of these festivals has made me feel the sense of excitement that lit up Luchino Visconti's face all those many years ago. Almost every day of the year a film festival takes place somewhere in the world--from sub-Saharan Africa to the Land of the Midnight Sun. Sundance to Sarajevo is a tour of the world's film festivals by an insider whose familiarity with the personalities, places, and culture surrounding the cinema makes him uniquely suited to his role. Kenneth Turan, film critic for the Los Angeles Times, writes about the most unusual as well as the most important film festivals, and the cities in which they occur, with an eye toward the larger picture. His lively narrative emphasizes the cultural, political, and sociological aspects of each event as well as the human stories that influence the various and telling ways the film world and the real world intersect. Of the festivals profiled in detail, Cannes and Sundance are obvious choices as the biggest, brashest, and most influential of the bunch. The others were selected for their ability to open a window onto a wider, more diverse world and cinema's place in it. Sometimes, as with Sarajevo and Havana, film is a vehicle for understanding the international political community's most vexing dilemmas. Sometimes, as with Burkina Faso's FESPACO and Pordenone's Giornate del Cinema Muto, it's a chance to examine the very nature of the cinematic experience. But always the stories in this book show us that film means more and touches deeper chords than anyone might have expected. No other book explores so many different festivals in such detail or provides a context beyond the merely cinematic. Kenneth Turan is film critic for the Los Angeles Times and a frequent contributor to National Public Radio's Morning Edition. He is director of the Los Angeles Times Book Prizes and the co-author of Call Me Anna: The Autobiography of Patty Duke (1987).